Os grid reference: SK 1325 5069. The very pretty little village of Ilam in north-east Staffordshire stands beside the River Manifold, 4 miles north-west of Ashbourne and 2 miles north of the A52. It is situated just a few miles from the border with Derbyshire. Beside Ilam Hall, an early 19th century Gothic building, stands Holy Cross church, originally a Saxon foundation and, in the churchyard near the porch and at either side of a more modern churchyard cross, are two Anglo-Saxon preaching crosses; one being a typical Mercian-style cross, although both are now without their cross-heads. In the church there is the medieval shrine and tomb of the local hermit saint, Bertelin, and close by are two holy wells associated with the saint – which were credited with miraculous healing powers. The smaller of the two crosses is decribed as traditionally Mercian in style. It stands at 4 feet 3 inches high and is a cyllindrically-shaped pillar with very little of it’s round cross-head surviving, having suffered from vandalism, although a small boss can still be seen. A raised collar runs around the middle with some raised links running downwards forming a square. The rest is now well-worn and difficult to identify. When it was examined just below ground in 1890 by Rev G.F.Browne it was found to be standing in a rude-stone socket. 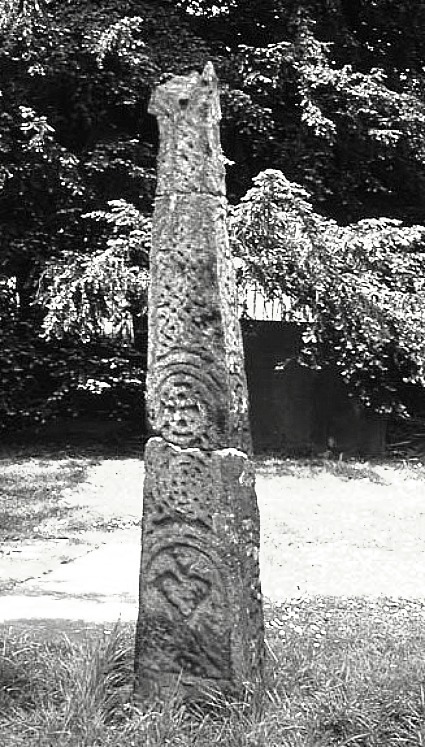 The second cross over 5 foot high is the more normal Anglo-Saxon thin pillar-shaped cross that has been restored in two places – again due to vandalism. The cross-head has long since gone. However, this cross still displays some interesting carvings including a scroll or circle, knotwork interlacing and, at the bottom, what could be the top part of a human figure is portrayed in a rounded panel. 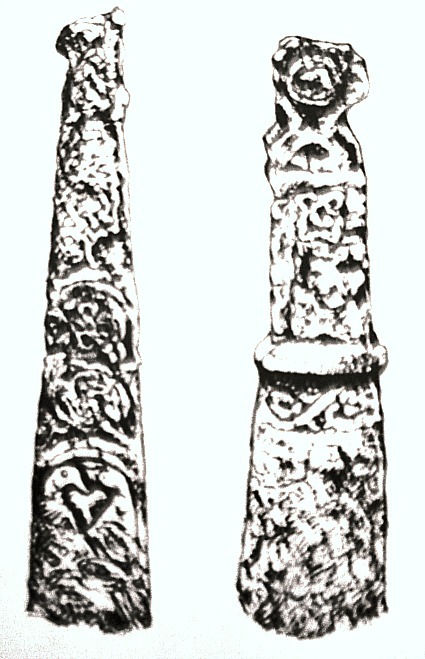 Both crosses date from between the 8th-11th centuries AD. A third rather battered cross shaft stands on Paradise Walk beside the River Manifold in Hinkley Woods half a mile to the south-west of the church. This one was rescued in 1840 from the foundations of a cottage close by and was said to have originally marked the site of a battle between the Saxons and Danes. It is referred to as ‘The Battle Stone’. The well-worn carvings are similar to those on the two Ilam churchyard crosses, and of a similar date. In Holy Cross church is the medieval shrine tomb of the local Saxon saint, Bertram, Bertelin or Bettelin, an 8th century prince of Mercia who lived here as a hermit. According to the Legend, St. Bertram visited Ireland where he married an Irish princess, but soon returned to his father’s kingdom of Stafford (his father may have been King Ethelbald?) along with his pregnant wife, but on the way both his wife and new-born baby son were killed by wolves. Later, he became a Christian and studied under St. Guthlac at Crowland, Lincolnshire, but as a penence for what had happened to his family he decided to withdraw from the world and became a hermit beside a well (St. Bertram’s Well) at Ilam. The well is still there today beneath an ash tree, locally called St. Bertram’s Ash, which can be found on Bunster Hill near Townend farm to the north of the village. This healing well is located on a strong ley-line that links the prehistoric sites of Foolow and Arbor Low in Derbyshire, a distance of over 16 miles. But there is another well associated with the saint just a little south of the church beside Paradise Walk. This is a rectangular walled construction with a holy water basin (baptismal pool) in the middle. St. Bertram supposedly died here at Ilam in the early 8th century AD and his tomb and medieval shrine were built over his resting place within Holy Cross church to which pilgrims came, and still do, in the hope of a miraculous cure. However, some historians are of the opinion, whether right or wrong, that the saint died at Stafford, of which he is now the patron saint with his feast-day on 10th of August. Sharpe, Neville T., Crosses Of The Peak District, Landmark Publishing Ltd., Ashbourne, Derbyshire, 2002. Pickford, Doug., Staffordshire – Its Magic & Mystery, Sigma Press, Wilmslow, Cheshire, 1994. Browne, G.F. Rev., On The Pre-Norman Sculptured Stones Of Derbyshire, [thesis], 1890. Categories: Ancient Crosses, Holy Wells, Ilam Churchyard Crosses In Staffordshire | Tags: Ancient Crosses, Ilam Churchyard Crosses In Staffordshire | Permalink. Great post. Sadly the ash tree was cut down some time back but the spring survives. The more substantial well near the church has only recently termed St Bertram probably because its nearer.. Check my blog if you’re interested in holy wells and related. Insearchofholyandhealingwells.wordpress.com, three posts a month come and join us! Thank you for that info its been a number of years since I was at Ilam. Have had another look at your blog and its very interesting. I seem to know your name from another website could it be Holy Wells & Water Lore ? Anyway thanking you for your kind comments. Its nice to think that there are other folk interested in wells and springs.